The Shenhua-Guodian tie-up may be the first among a handful of possible mergers in China’s power industry as top policy makers try to cut industrial overcapacity and the number of state-owned enterprises. Monday’s announcement concludes months of speculation about the combination, first reported by Bloomberg in June. Shenhua Group, which will change its name to China Energy Investment Corp., will absorb Guodian Group and become the parent of the reorganized entity, the listed units of both companies said in separate Hong Kong filings. The listed companies are also forming a coal-fired power joint-venture, which is subject to shareholder and regulatory approvals. The new company will have installed capacity of more than 225 gigawatts, topping Electricite de France SA and Enel SpA, according to Frank Yu, an analyst at Wood Mackenzie Ltd. EDF, as the French generator is known, had net installed capacity of 137.5 gigawatts last year, according to a company presentation. Italy’s Enel had total installed capacity of 83 gigawatts as of June 30, it said. Shenhua will be able to lower its reliance on coal-fired capacity, currently about 90 percent, by gaining some of Guodian’s clean energy assets, Yu wrote in a research note earlier this month. Guodian, meanwhile, will be able to benefit from Shenhua’s coal supply and price risk management, as well as its integrated infrastructure of railways, harbors and ships. Shares of Shenhua’s Hong Kong-listed unit, China Shenhua Energy Co., rose as much as 1.9 percent to HK$19.98 on Tuesday before paring its gain to 1 percent as of 9:56 a.m. local time. The city’s benchmark Hang Seng Index lost 0.7 percent. Shares of Guodian’s main Shanghai-listed unit, GD Power Development Co., will remain suspended until Sept. 4, it said Monday. Shenhua had 1.014 trillion yuan in assets, it said in a report in June, and its listed unit produced about 290 million tons of coal last year. Guodian had total assets of 803 billion yuan, according to a statement from the company posted by state-backed industry group China Electricity Council. Shenhua had 82 gigawatts of generating capacity, while Guodian had 145 gigawatts, according to BNEF. 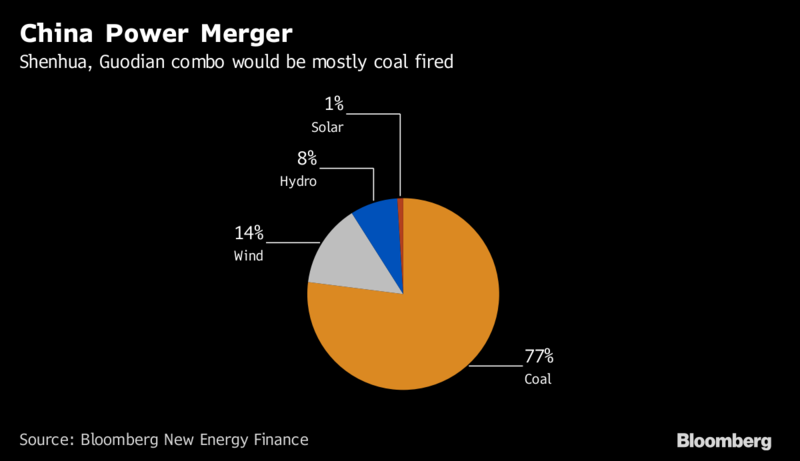 The merged entity will account for 13 percent of both China’s power-generating and coal-mining capacity, according to analysts at Citigroup Inc. including Jack Shang, who pegs the new company’s totals at 221 gigawatts and about 500 million tons a year, respectively. Xi’s government is also seeking to lower the country’s reliance on coal power and increase the use natural gas, as well as wind, solar, hydropower and nuclear. The generation capacity of the merged company will be 23 percent renewables, according to BNEF. The government may also seek a way to bundle nuclear power generators into the mega-merger mix, according to Wood Mackenzie’s Yu. China Huadian Corp. and China Datang Corp. are the remaining two of China’s big-five state-power generators. Hong Kong-listed Datang International Power Generation Co. rose as much as 1.9, while Huadian Power International Corp. added as much as 1.5 percent in Shanghai.